You might suspect that when you say farewell to the bright lights of the big city, pack the belongings and head to your own piece of rural Eden that you have to tell all things culture, “Goodbye”. But that’s not the case, because living rural lends itself to another kind of culture… silviculture! What is silviculture? It’s the term used for growing, tending, and harvesting trees to produce a healthy forest. It’s a system practiced by federal and state forestry agencies, as well as managers of large tracts of private forested land, but it’s also beneficial for the individual landowner, whether you own two or two hundred acres. It’s rewarding and assuring to own acreage. If you own land, your very own piece of the Earth, you’ll always have a place to go. You have your own place to live, to abide, or settle down come what may. There’s room to house all your possessions, a place to roam and romp and enjoy nature, and if you treat it right your land can help sustain you—and even turn a profit. That’s where silviculture comes in. Not to say your acreage will make you a million dollars. But if managed right, the naturally-occurring resources—trees in this instance—can generate funds or usable goods. That can mean big healthy shade trees to sit under, or nut- or fruit-bearing trees for seasonal snacks and treats. It can mean a constant source of firewood to heat your home or workshop, or money in the bank from the sale of timber. The best way to manage timber is by selective harvesting of mature, dead or less desirable trees. Here the author prepares to drop a less desirable softwood tree to help open an area for a more profitable hardwood tree to grow. Sure, trees will grow on their own and eventually an abandoned field will become a forest. But it’ll take a long time and the results may not be very beneficial. For the first decade, you’ll get a mixture of cedar and maybe some post oaks or other scrub brush and junk trees. Eventually, the field will fill in and the fastest growing trees will rise above and overshadow and stifle any slower growing trees. Problem is, the trees leading the race toward the sky may not be the best in the long run. That’s where woodlot management, or silviculture, comes in. First, there are lots of sources for information about timber-land management. Most states have land management agencies and I’d suspect all of them produce some kind of helpful brochure. And the U.S. Forest Service offers help guides as well. One of the best is the Missouri Department of Conservation’s “Forest Management (for Missouri Landowners)”. The 116-page book contains details about all the nuts-and-bolts information a landowner would ever need to know about growing trees. In fact, it has way more information that most readers would care to work through (as is the case with most government-produced documents). But the following paragraphs will provide the basics discussed in such how-to guides. When you’re done reading this article you’ll have a good feel for whether you wish to, and if so how to, manage your rural property for its maximum timber quality and volume. Maybe you’re new to rural life and just purchased a piece of land, or perhaps you’re dreaming and starting to formulate your plan to abandon city life for the solitude and clean living that country life can offer. If so, consider this: growing a forest is like growing a gigantic garden. Maybe you’ve never thought of it as such, but it’s the case. Trees are plants which need nutrients, water, and sunlight. Give them the right amount of each and your “garden” will be the best possible. What, you still don’t think of wooded acreage as an agricultural endeavor? Many states, including Missouri, tax wooded land at an “agriculture” rate versus the higher cost for “unimproved land” because trees are a renewable commodity. Likewise, trees are belongings which can be insured with compensation paid for accidental loss. Just like you weed a garden, or pinch suckers (excess blooms) from a tomato vine, or seed heavy and then thin sprouts to keep the best plants with the right spacing for maximum growth, the same is required of your forest garden. To make the most of your stand of trees you have to thin out undesirables and excess growth to benefit what remains. In a moment we’ll discuss what makes a tree “undesirable”—it can be the tree species, defects from injuries or illness, or simply that it’s growing in the wrong place or too close to more desirable trees. 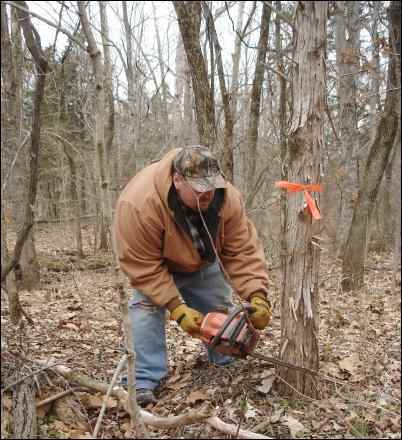 Since it’s hard to otherwise control the light, water, or nutrients on a big tract of land (as opposed to a backyard garden), the number one tool a woodlot manager can utilize is cutting. Mature trees should be tall, straight and ideally free of limbs in the first 20 or more feet of the trunk. This allows at least two logs to be cut from the downed tree. The decision to cut trees is usually made for one of four reasons: clearing land for other uses, selling timber for profit, harvesting wood for your own lumber or firewood, or thinning for management purposes. 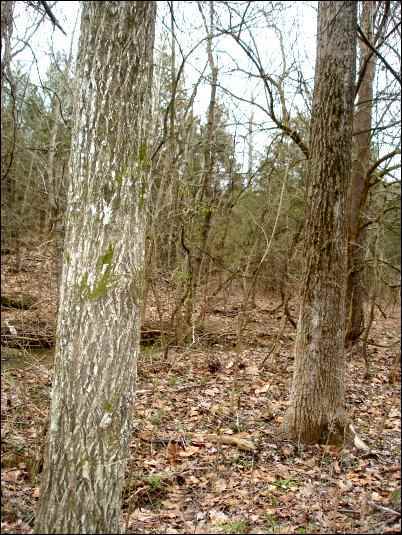 That last reason for thinning can be divided into two types according to “Forest Management (for Missouri Landowners)”: 1) Regeneration—clear-cutting or otherwise aggressively thinning and regrowing a woodlot, or 2) Intermediate cuttings—selective cutting in a mixed-growth forest to maintain rate and health of multiple generations of trees. It makes sense to manage your piece of wooded land. A few of the ways to do this include clear-cutting, seed-tree selection, the shelterwood method, or single or group selection. Clear-cutting takes all trees down to stumps at the same time. Then you grow a new forest from stump sprouts or seedlings. This doesn’t necessarily mean you clear every tree from your property at once. You can clear-cut portions of your wooded land and then aggressively manage those areas as new forest grows. Shading from taller trees is always a concern when growing new trees, especially oaks and hickories. So you’ll want to do a clear cut of at least roughly two acres, keeping in mind that the perimeter may not grow as well due to shading from remaining trees around the edges of the newly cut portion. To clear cut for regrowth, not for clearing for a new field or homesite, you should first target any usable tree whether it be for lumber or firewood. Next, fall or girdle-cut any tree two inches or thicker that remains. Sometimes it makes sense to “girdle-cut” a tree instead of felling it green. Girdle-cutting kills the standing tree, which can make it suitable for wildlife habitat or quicker to dry/season once it is cut. To make a girdle-cut, use a chainsaw or axe to create an inch-wide groove an inch or two thick (at least deeper than the outer bark layer) all the way around the perimeter near the base of the tree. Pour or spray liquid herbicide, such as glyphosate, into the fresh wound on the trunk. The cut disrupts the flow of sap from the roots to the rest of the tree, and the herbicide speeds the killing. If you enjoy hunting or watching wildlife, you might choose to also leave any trees with hollow areas or well-used nests for wildlife. It’s also a good idea to leave a few trees along any waterway to provide a buffer and help prevent erosion. Clear-cutting is an extreme measure. Sure, it will generate some revenue now if you choose to sell marketable timber, or sell the firewood it produces, but understand that it’ll be probably fifteen to thirty years before that piece of land will produce any timber of a size to have market value again. Still, there are times when clear-cutting makes sense – such as when the existing trees are decaying, of poor quality, or are a species that has little value. Take, for instance, ash trees in the Midwest, or other types elsewhere in the country, where a bug or fungus has ravaged a specific species and wiped out an entire region of those trees. It’s happening across the Midwest with the Emerald Ash Borer. It makes sense to harvest what value remains and replant the land in a different type of tree altogether. Another example of a good time to clear-cut would be an area that has been left unmanaged for years and the tallest trees are of undesirable types. Trees whose limbs grow low on the trunk do not make good veneer lumber, which tends to bring a higher price than board lumber. But if those undesirables are the tallest on your property and have large canopies it is unlikely that newly-planted trees will have a chance when competing for sunlight and ground moisture. In those instances, it may make sense to clear-cut an area and start over. This is where it might pay to hire a private land forester to visit your property and talk about current and future market value of the trees you own. That second set of trained eyes and wealth of knowledge could pay for itself in the sale of one healthy tree now or 20 years down the road. 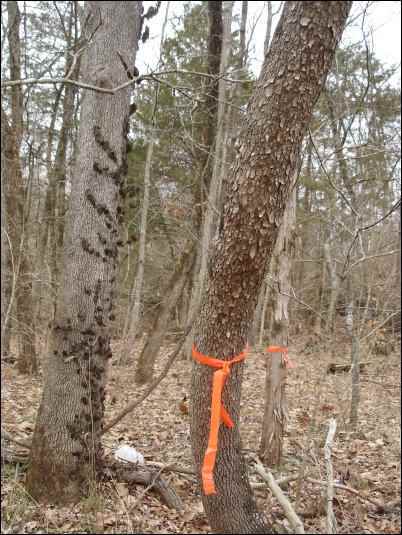 The “seed-tree system” is a low-maintenance way to manage a woodlot if the types of trees already established are what you want to grow anyway. Seed-tree means leaving a desirable type of tree growing scattered across a thinned-out lot with the idea that the mature trees will provide seed for new growth around them. This is the case when your existing stand contains desirable trees—white oak, hickory, or walnut for instance—and many of the mature trees are still alive and doing well. In this case, you might want to take some time and weed out any undesirable trees from the group—maybe cedar, post oak, pine, silver maple, cottonwood, sweetgum as an example—then allow the better species to drop seeds on the freshly-cleared soil. As those seedlings grow and start to become established, you can remove the large mature trees, do any remaining thinning needed to the saplings, and then let your new forest grow. To assure you have enough seed trees, you should leave about a dozen of your desired trees per acre. You’ll have to revisit the land a couple times a year and remove any unwanted saplings, such as cedar and pine, that might spring up. Or if growing pine is your goal, you’ll need to eliminate any hardwood trees and maybe even do a prescribed burn* to prepare the soil. A great way to start a woodlot management plan is to take a walk through the area to be managed and mark trees to be removed first. This can be done with spray paint or marker tape. Undesirable trees are the first to be marked. They can be bent, stunted, sickly or just the wrong species. *A word of caution regarding prescribed burning: if you think a “controlled” burn is the way to go, before you even light a match, have a long and serious talk with your local Conservation Department. When you’re dealing with fire in the forest, things can get dangerously out of control in a heartbeat. You should be as prepared as possible and notify any authorities recommended by the Conservation Department so that they might be ready in case you need fire-fighting assistance. The downside to allowing trees to produce seeds for new growth is that you have less control of the spacing of trees and where the new growth happens because it is the wind that scatters the seeds. There’s also the potential of your “seed trees” being damaged in the meantime by pests, fire, or wind. In 2009 a fluke “inland hurricane”, as described by the National Weather Service, tore through an area of Southeast Missouri and blew down hundreds of thousands of mature hardwood trees in a several-county-wide swath. The unanticipated storm immediately turned mature-growth forest-land into a maze of gigantic Pick-up Sticks. The hard thing to accept was that, in many instances, the straight-line winds toppled tall, straight, healthy trees while leaving behind gnarly, twisted, dead timber. Much of this land has since been timbered, stumps removed and either turned into fields and pasture, or replanted with mail-order seedlings. Some less-damaged timber stands are regenerating by way of seed trees. Another variation of seed-tree, which takes a little more ongoing maintenance but assures a better chance of new growth, is called “shelterwood”. In this instance, the property owner cuts trees three times during the early growth of new timber. If you have a good crop of desirable trees, and don’t need to sell a large amount of timber for money right now, than this method may be a better bet. It requires some ongoing thinning of a decent starting stand of timber, which could provide some ongoing revenue or supplies of firewood. Under this plan, the first thinning to be done would be to remove unwanted, dead, or fully mature trees. You would ideally take out about thirty to forty percent of the standing timber, opening up the canopy in the process. Then you would wait a few years until the existing trees (of the type you desire to grow) have dropped seeds which successfully sprouted into seedlings. The more trees left initially, the more seeds dropped and, you hope, more new trees taking root. Now you want to eliminate around fifty percent of the mature trees to allow more sunlight to reach the saplings. This second cut is going to come five years or so, on average, after the initial cut. In the Ozarks, where this writer lives, it often takes twenty years or more for hardwood trees to reach the small side of marketable. It’ll take nearly that long for them to become viable enough to hold their own against competing trees. The third and final cut in the shelterwood plan is to take out the remaining old growth trees to allow the younger generation to mature uninterrupted. The final two woodlot management methods are the choices most often seen and used by small property owners. Both are more hands-on ways of maintaining wooded land, but even then the amount of time required for a tract of land fifty acres or smaller is minimal. The “single-tree” and “group-selection” systems involve ongoing thinning of mature and undesirable trees. These are great methods for a property owner who needs a constant source of firewood from winter to winter, or maybe a little supplemental income along the line. If you want to maintain a good mix of wildlife on your wooded land, consider leaving a few dead trees to be used for dens and nests. This tree is hollow and bent, making it all but worthless for lumber. It might provide a few sticks of firewood, or be a great home for birds, squirrels, and other creatures. Single-tree means you look at your stand of timber and assess each tree individually. While you might do some thinning of overcrowded or sickly and misshapen trees initially, over time you simply remove the mature trees every year or so and let new trees sprout up from seed or stump sprouts in the openings. The downside to this system is that it does little to open up the canopy and let more light reach the ground, so the trees which grow well are shade tolerant varieties—such as red maple, sugar maple, dogwood, and softwood varieties. Hickories and oaks demand more sunlight. It’s important to not remove all the best and largest trees at one time. Owners tend to want to cut and sell the high-dollar timber and leave the smaller trees to grow. Here’s where you really have to look at each tree on its own merits. A small or slow-growing tree may be as such because it’s sickly—in humans we’d call it a case of bad genes— or the tree may be stunted because it requires more sunlight or moisture than is available. 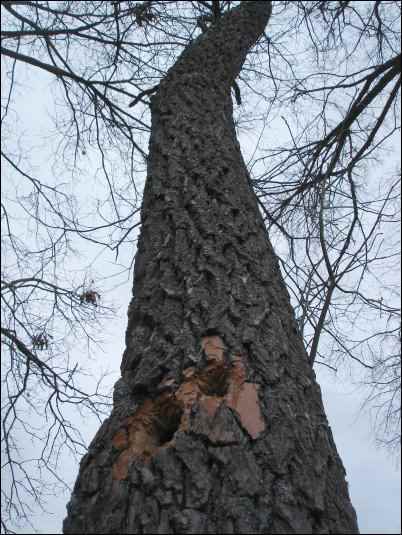 In that case, thinning nearby mature trees may cause the smaller tree to surge upward and outward. Or it may just be a sickly tree which will never reach a size necessary to bring you any real money. The final process we’ll discuss here, the group-selection method, is capable of producing oaks. Group-selection is kind of like having mini-clear-cuts, instead of weeding out individual trees. The small openings will allow oaks and hickories, which require lots of sunlight, to grow in the middle of the clearings. A downside is that the less-frequent cutting will not provide a constant supply of firewood. An upside is that by creating the small clear-cuts mixed among the thicker, older timber it will result in an increase of brushy forage which is great for wildlife. The edges of the clearings will grow browse (plants with vines, berries, and leaves which offer food sources and cover for animals). Mast (nut) producing trees will also provide wildlife food, and eventually a good price for the lumber once the trees are harvested. What does all this mean? Sure, you can buy a piece of rural land and clear out enough space for a home, then let natural life happen around you with little hands-on involvement; but another option is to devise a simple plan, put in a little occasional physical effort (or hire the work out), and over the years grow a healthy, profitable forest on your own little piece of the planet. I was thinking about getting a land clearing service for the yard of my fiance and I’s new home. We want to make sure that we are getting a high-quality service. We will make sure that we contact someone that will use a group selection method since this sounds like a comprehensive way to get the job done right.